Alongside its line-up of Alaska and Hampton Yachts, Leigh-Smith Yachts (LSY) will host the Australian release of the new 2018 Fairline Targa 48 GT. This model was designed by Alberto Mancini with spacious cabins, large saloon and galley-up layout to suit the Australian boating lifestyle. The Targa 48 is a sleek sportsyacht with three cabins and double en suites. The midships master is large and well-appointed, says LSY. The second forward cabin has the versatility of converting from a vee-berth to a double bed making the boat suitable for a family or two couples, while the dinette can also convert to a third double bed. The hardtop's electric sunroof lets light flood into the spacious and sociable upper deck that offers plentiful seating, a foldout teak table and large sunbed. A garage in the aft deck can accommodate a sizeable RIB and, along with the submersible swimplatform, makes this boat a versatile and exceptional design, we're told. LSY said twin Volvo Penta 600 IPS engines power the 48 GT and give it "exhilarating performance, handling and impeccable sea keeping". The British-built Fairline Targa 48 GT will be joined at SCIBS by the Alaska 44, Alaska 47 and Hampton Endurance 720. Australian multi-state brokerage Sundance Marine presents to Sanctuary Cove showgoers the Monte Carlo Yacht MCY 76, as well as the French-built Prestige 460 motoryacht and a range of Invictus luxury dayboats from Italy. Sundance Marine said it is anticipating plenty of buzz about the MCY 76 with its distinctive maroon hull, conveying the full custom-made experience of the lauded Italian brand. The brokerage said the 23m MCY 76 is an award-winning motoryacht that represents a "new benchmark for luxury" with its stylish features including an open flybridge and innovative onboard technology. Sundance Marine added it was also looking forward to exhibiting the luxury motoryacht brand Prestige, part of the Beneteau Group, for the first time at SCIBS after it was appointed as the local dealer for the marque at Boot Dusseldorf in February. Sundance predicts the Prestige 460 will have broad appeal as a family coastal cruiser, suiting people looking for quality and performance at an accessible price. The Yacht Brokerage and Flagstaff Marine have united to present a mega on-water display for the mighty French brand Beneteau, combining a large selection of the yard's sail and power boats. 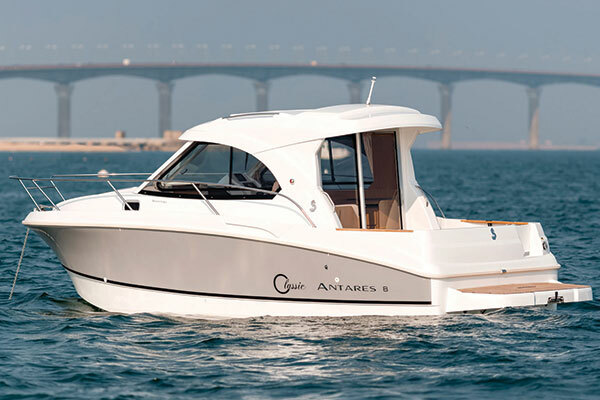 Representing Beneteau's power boats, The Yacht Brokerage will be unveiling the Antares 8 and the Barracuda 7 and 8 on-water for the first time in Queensland at SCIBS. Boasting a new flared-out hull design together with optimum living space, the Antares 8 is described as the perfect motor cruiser for a coastal escape, while the Barracuda 7 and 8 target the avid sportsfisherman or adventurer being equipped with a large starboard walkway, an entirely modular easy-to-access cockpit and spacious design. Both models are built on Beneteau’s revolutionary Air Step hull, ensuring maximum safety, comfort and fuel-efficiency without compromising on speed and acceleration. Beneteau is the world’s number one selling yacht brand and will be represented by the Beneteau Oceanis 35.1 and Beneteau 45. The latter is a recreational yacht that easily transforms to commercial charter. New to Australia and launching at SCIBS, the Beneteau Swift Trawler brand will be on show with the 35 and 44 models presented by Flagstaff Marine. The Swift Trawlers blend traditional lines with modern cues, and are described as being great for cruising the Australian east coast to the Whitsundays and back, as well as rivers, canals and islands. Said to be easily handled by a couple or family, the Trawlers feature lots of living space, full helms top and bottom, plus bow and stern thrusters. Clipper Motor Yachts will have 10 boats on display at SCIBS, including the world debuts of the Hudson Bay 540 and Hudson Bay 390. These semi-displacement, bluewater cruising motoryachts represent a new direction for the marque and were penned by superyacht designers Patrizio Facheris Design Studio, based in Florida, USA. The new 540 is the flagship of the Hudson Bay sedan range and combines the economy, safety and stability of semi-displacement cruising with the flair, styling and design of a world-class sportsyacht. These new models, we're told, combine an entertaining layout for the Aussie boating lifestyle, with an ocean passagemaking keeled hull and diesel shaftdrive designs. Clipper said the Hudson Bay range has cutting-edge interiors and modern exterior designs based around the 540 hull and engineering platform, resulting in a "contemporary style of motoryacht with ‘wow factor’ and state-of-the-art European flair and design". Grand Banks Yachts will exhibit the new Eastbay 44, the first in Australian waters, at Sanctuary Cove. The new EB44 combines an eye-pleasing blend of contemporary finishes and Downeast lines with an advanced hull design that is capable of safe and comfortable passages in open water. Clean, classic lines are accentuated by the beautiful teak interior and impeccable craftsmanship of the three-stateroom layout. 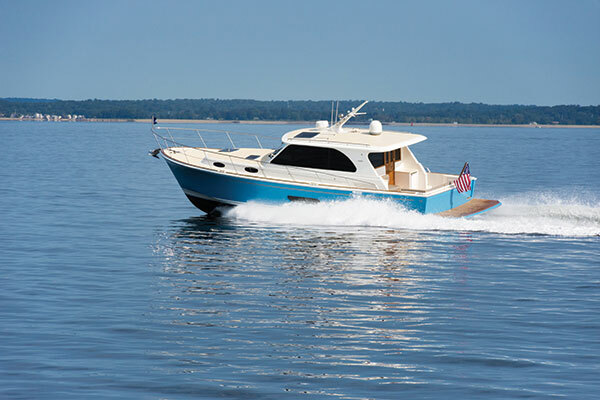 Overnight accommodation for six people and entertaining space for more are what Grand Banks says make the EB44 an ideal family cruiser. The wide, full-beam saloon and cockpit feature large electric windows, while a traditional deep-vee hull is claimed to achieve a fast, smooth and dry ride that also allows for tight manoeuvrability to make docking a breeze. Mooloolaba Yacht Brokers (MYB) presents the popular Jeanneau 349 Sun Odyssey which, for SCIBS 2018, will be the three-cabin, performance version of this yacht that hosts a lifting keel, suiting both competitive and cruising sailors. The agent says there are more than 500 of this model sailing around the world, with 45 of them in Australia. Designed by Marc Lombard and true to the values of the Sun Odyssey line, MYB described the 349 as the perfect combination of performance, comfort and safety at sea. 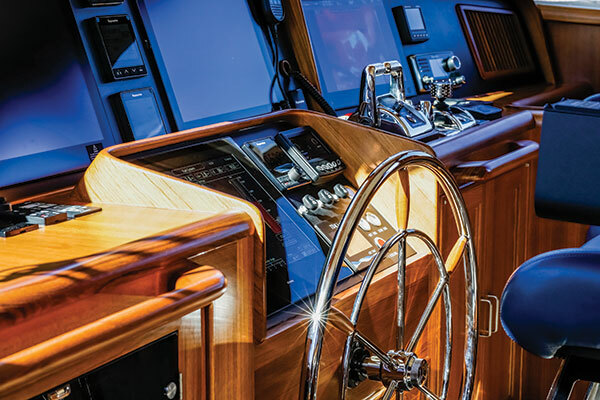 Inside the easy-to-handle 349 are high-quality woodwork accents and a light, bright ambience, with generous volume and inviting cockpit. 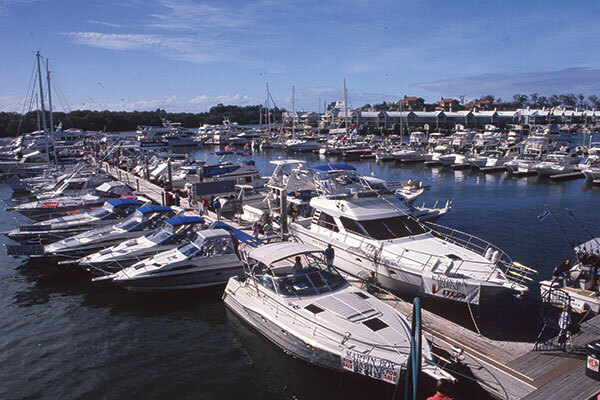 With three new boats on the water at SCIBS this year, Palm Beach Motor Yachts will, according to show organisers, attract more than its share of attention. There will be two variants of the flagship Palm Beach 65 on display, plus a sporty Palm Beach 42. As mentioned, the PB65 will be shown in two versions, the sedan and flybridge. The flybridge model is the first with black accents and features a carbon fibre dash, sinks, shower areas, and heads. The sedan model is also expected to turn heads with a neat jacuzzi on the foredeck. The Palm Beach 65 was launched in 2009 to critical acclaim and boasts a vast, light-filled interior with the entertaining spaces easily accommodating 15 people. Australia and New Zealand's multihull specialists, Multihull Central, will display six models at SCIBS 2018, including the innovative new Seawind 1190 Sport in an Australian debut. This latest model is unique in that it has daggerboards, retractable rudders, a taller rig, aramid-fibre high-tech sails, carbon bowsprit, spinnaker, plus loads of enhancements to appeal to monohull sailors coming to multihulls and catering to the new wave of sailing enthusiasts who want performance out of a cruising cat. 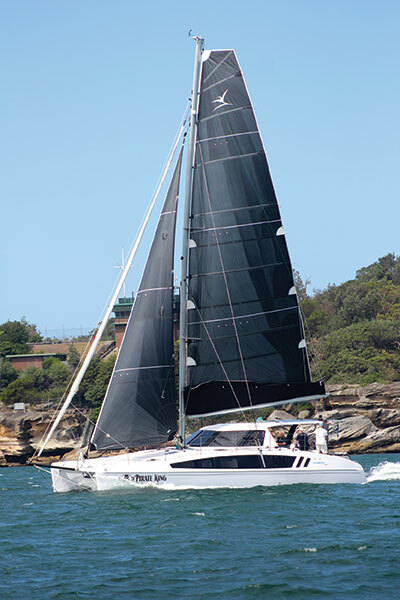 The brand-new Corsair 760 Trimaran, the "pocket racer-cruiser", is also making its Australian debut at SCIBS. This nifty little yacht is trailerable and boasts a berth, sink, stove, freshwater and basic bedding for overnighting. In its power range, Multihull Central will present the Aquila 48 in an Australia premiere, the Aquila 44 which is being offered as a syndication boat with Yachtshare, and the Aquila 36 in a family/fishing version featuring livebait tank, aft rod racks, barbecue, full windscreen, and loads of refrigeration. 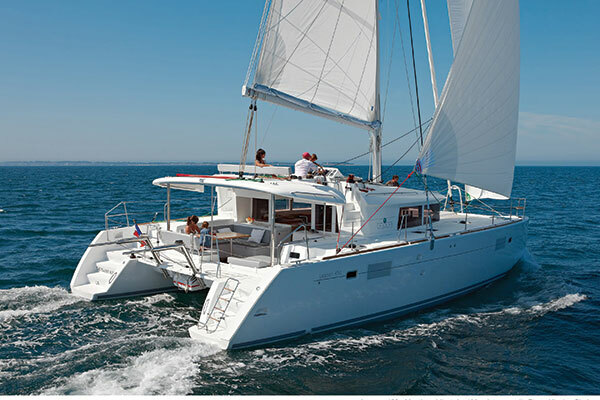 Not to be outdone, Australia and NZ's other notable multihull brokerage, Multihull Solutions, will present two of the most popular models from respected French marque Fountaine Pajot: the Lucia 40 sailing cat, and making its Australian debut the MY 44 power cat. Launched in 2017, the MY 44 was created by internationally renowned naval architects and designers Daniel Andreiu and Pierangelo Andreani, and awarded the 2018 European Power Boat of the Year in its category. According to the dealership, the MY 44 has been designed to deliver "extraordinary offshore performance and outstanding fuel economy", affording in excess of 2000nm on one tank of fuel, we're told. With 2000-litre fuel and 700-litre water capacities, the catamaran is ideal for long-range cruising and is claimed to achieve a top speed of around 30kts with optional 435hp IPS 600 engines. Additional features including hydraulic passerelle and dinghy crane. Okay multihull fans, you want more? Then don't forget The Multihull Group (TMG) will have the sensational Lagoon 450 on show at SCIBS this year, as well as the Australian debut of the Dragonfly trimaran brand from Denmark. The 450 is one of the most popular of Lagoon's models, with 1000 boats launched. It’s considered a great all-rounder, with appeal to families and couples looking for a luxurious cruising cat that is equally suitable for weekend sailing as it is for long-range cruising. Recently announced as the Australian dealer for Dragonfly Trimarans, TMG will be displaying two of the brand’s exceptional models for the first time at SCIBS: the 25 and 35ft models. These dynamic multihulls can be specified as fun, fast family cruisers to an even faster performance offshore racer. All Dragonfly models use the ‘Swing Wing’ system that allows the trimaran to be folded to reduce the beam by more than 50 per cent in less than one minute per side, using no tools and operating only from the cockpit. This system enables these boats to become trailable in the smaller models or fit perfectly in a single marina pen. From iconic British brand Sunseeker, the Manhattan 65 is said to be designed to entertain and built to thrill. The Manhattan 65 is a lavish display of versatility and superior craftsmanship, combined with cutting-edge design, setting a new benchmark for mid-range yachts, said SCIBS. Spacious and superbly appointed, the Manhattan 65 accommodates up to eight guests in complete comfort, from the main saloon with a separate dining and seating area, to the luxurious outside areas including the stunning flybridge. A four-cabin flybridge model with spacious aft deck and saloon, stabilisers and excellent amenities, the Manhattan 65 will have nautical entertainers and long-range cruising sailors all swooning. Sure to command attention at SCIBS will be the 32-metre Majesty 100 OneWorld, the entry-level of United Arab Emirates builder Gulf Craft's six-boat Majesty superyacht collection. Represented at Sanctuary Cove by Australian Superyachts, the Majesty 100 is the first in Gulf Craft’s collection to have a partially enclosed flybridge, allowing guests sitting within its lounge area to enjoy sweeping sea vistas as though seated in a traditional flybridge. With stunning exterior, lavish interiors, and naval architecture and design courtesy of Gulf Craft’s own in-house design studio, the layout of the Majesty 100 is based on the principles of maximising space and an ensuring an outdoor-interior connection through such things as floor-to-ceiling windows in the main saloon. This superyacht can accommodate up to 12 guests in five staterooms, each with en suite, and a crew of six. Built to RINA Commercial Yacht Charter Class, Cayman Islands LY3 (Short Range) and AMSA’ NSCV Code Class 1E & 2C, OneWorld is optimised for the Australian charter market. Making her Australian debut is one of superyacht builder Ocean Alexander's top-selling models, the 85 Motoryacht. Combining classic semi-displacement hull design with contemporary elegance, the 85’s genius, it is said, is in the details. Her interiors offer an abundance of light through large windows, space and luxury, and the finishes and fittings as found in exclusive terrestrial mansions. Ocean Alexander says the 85 is an "excellent" entertaining platform with ample room for guests to roam including the expansive flybridge area, while below deck guests get to enjoy luxury accommodation. Said to mark a new era in design, the 85 maintains Ocean Alexander's 40-year heritage of engineering for safety, performance and comfort. From Fleming Yachts Australia is the new Fleming 58 passagemaker designed by Brisbane's famous Norman R. Wright & Sons boatyard. The new-from-the-keel-up 58 was created to fill the gap between the 55 and the 65, and by popular demand has a full-beam master cabin below the pilothouse and an engineroom with full headroom. The standard specification contains a multitude of items that would be optional with many other builders such as stabilisers, thrusters, twin anchor winches, davit for tender and much more, including digital switching, a full array of the latest Raymarine navigational equipment, Twin Disc Joystick Control with the popular Position Hold feature, in addition to traditional electronic throttle and gear levers. The Fleming 58 is said to be super-smooth and quiet at all rpm, and even when shifting gears from forward into reverse. SACS Marine Qld exhihits the new Strider 13m RIB supertender with "all the bells and whistles", as well as the SACS Sports 9m and Sports 7m models. The brand-new Strider 13 is a jaw-dropping dayboat that takes RIB watercraft to the next level, with a cabin, head, and joystick control plus twin 370hp Mercury inboard diesel engines. It’s fully kitted with generators, air-conditioning, Fusion sound, Raymarine screens and more, making the SACS Strider 13 an ideal day cruiser, entertainment platform, watersports boat for extended family and large groups, and a comfy overnighter for a couple.